Title: "The German Genius: Europe's Third Renaissance, The Second Scientific Revolution and the Twentieth Century"
Comments: I have just (as of 6th May 2012) finished reading “The German Genius: Europe's Third Renaissance, the Second Scientific Revolution and the Twentieth Century” by Peter Watson and felt, though this book might not seem to "fit in" with the other books referenced on this website, it is only right to advise those who might be visiting as to what, in my humble opinion, a great book this is. Though those visitors to this website who are German or of German extraction may be familiar with all or most of the names given below, as an Englishmen I was only aware of the contribution of some of them, mainly the musicians and those involved in the early part of the last century e.g. Benz, Daimler and Krupp. The names I have included are certainly not a complete list of those he has written about in what is a rather “heavy going” book at times, what with it consisting of 856 pages (without including the “Notes and References” and the “Index” which takes it up to 964 pages) where he goes into a lot of detail as to not only what they contributed but the significance and impact their discoveries had. On a personal note, basically due to my interest in history, I was very interested in learning about the contributions of Johann Gottfried von Herder, Leopold von Ranke, Oswald Spengler and Martin Heidegger. I also found the information given about the comparison between “Gemeinschaft” and “Gesellschaft” extremely enlightening. 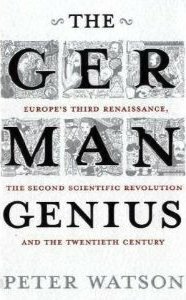 The importance of “Bildung” is covered in great detail and, although I can't say I understand its meaning exactly, what with it not apparently having a direct translation into English, I think I am now able to appreciate its significance in the development of German culture, education and society. Bach, Johann Sebastian; Benz, Karl; Boomer, Johann Jakob; Boltzmann, Ludwig; Brahms, Johannes; Büchner, Georg; Burckhardt, Jacob; Cantor, Georg; Clausius, Rudolf; Curtius, Ernst; Daimler, Gottlieb; Delbrück, Hans; Dedekind, Richard; Diesel, Rudolf; Dilthey, Wilhelm; Dreser, Heinrich; Ehrlich, Paul; Eichengrün, Arthur; Fichte, Johann Gottlieb; Gauss, Carl Friedrich; Gödel, Kurt; Goethe, Johann Wolfgang; Grillparzer, Franz; Grotefend, Georg Friedrich; Haber, Fritz; Haeckel, Ernest; Handel, Georg Friedrich; Haydn, Franz Joseph; Hegel, Georg Wilhelm Friedrich; Heidegger, Martin; Hertz, Heinrich Rudolf; Hilbert, David; Hintze, Otto; Hoffmann, Felix ; Hölderlin, Friedrich; Kant, Immanuel; Kekulé, August; Klein, Felix Christian; Koch, Robert; Krieck, Ernst; Krupp, Alfred; Lamprecht, Karl; Langhans, Carl Gotthard; Lenard, Philipp; Lenz, Max; Lessing, Gotthold Ephraim; Mach, Ernst; Mahler, Gustav; Marcks, Erich; Mendel , Gregor; Mendel , Johann ; Mengs, Anton Raphael; Moeller van den Bruck, Arthur; Mommsen, Theodor; Mozart, Wolfgang Amadeus; Nietzsche, Friedrich; Planck, Max; Riemann, Bernhard; Röntgen, Wilhelm; Scheler, Max; Schiller, Johann Christoph Friedrich; Schinkel, Karl Friedrich; Schmitt, Carl; Schmitthenner, Paul; Schopenhauer, Arthur; Schramm, Percy; Schubert, Franz; Schumann, Robert; Schweitzer, Albert; Simmel, Georg; Sombart, Werner; Sombart, Werner; Spengler, Oswald; Stark, Johannes; Steiner, Rudolf; Strauss, Richard; Strauss I , Johann ; Strauss II, Johann ; Tönnies, Ferdinand; van Beethoven, Ludwig; Virchow, Rudolf; von Clausewitz, Carl Philipp Gottlieb; von Feuerbach, Ludwig; von Gierke, Otto; von Gottsched, Christoph; von Helmholtz, Hermann; von Herder, Johann Gottfried; von Hofmann, August Wilhelm; von Humboldt, Alexander; von Humboldt, Wilhelm; von Karajan, Herbert; von Kleist, Heinrich; von Liebig, Justus; von Ohain, Hans; von Pastor, Ludwig; von Ranke, Leopold; von Siemens, Werner; von Sybel, Heinrich; von Treitschke, Heinrich; Wagner, Richard; Wegener, Alfred; Werner, Abraham Gottlob; Willstätter, Richard; Winckelmann, Johann Joachim; Wöhler, Friedrich; Wolf, Friedrich August; Wolf, Hugo. Perhaps if should be compulsory reading in England in order to counter the “all too common” Germanophobia perpetuated from various sources? After reading this book though, the thought is that perhaps its not Germanophobia, just jealousy? In 1905 he received the ultimate acolade, the Nobel Prize for Physiology or Medicine. He died of angina on April 9th, 1910. "Addicted" to chess and a great admirer of Goethe, Robert Koch probably benefited mankind - and the poor as well as the better off - more than anyone else to that point, and maybe since.